692) Challenging Yourself - Episode 1 ! "It is an irony of life that satisfaction and security are the enemies of excellence." While I was preparing to start a new series about the previous sentence and continue talking about changing our minds, I found my friend & Blog reader Mai posting a great video for one of the reputable Egyptians; Wael El Fakharany, about the "Discomfort of the Comfort Zone". So I decided to share the Video with you and add to it how to get out of your comfort zone. I have -more or less- made choices close to what Wael did in my life. After having a reputable post, being engaged with a multinational company, having a good salary, I decided to leave all that and work independetly. My family was against me, everyone was wondering about me leaving this warm area, the dream of every man, some people even told be that is "battar 3ala el Ne3ma (not accepting God's blessing)". Actually this didnt stop me, but made me wanting to challenge them and myself more. And now after 5 years, the same people are congratulating me and saying that I was right, and wondering how did I manage to do all that and match between teaching at AUC, corporate training, consulting, writing, and travelling. It wasnt, isnt, and wont be easy. I will tell you a secret, that is not the end, I am still midway through, and when I done, khalas, next chapter of my life will start EVEN if from scratch. The thing I may bet Wael for is being the happiest one with his job, I am in love with my job to the extent that I didnt get married "3ashan mageblehash dorra"; just kidding. 2. Pushing Yourself & Others. P.S> Special thanks to Wael El Fakharany for the session, and Mai for the link. 691) Would you change your mind?! Should we change our minds? What can make you change your mind? & Why? 690) "They Call it Freedom of Speech" ! The subject grasped my attention, and I asked myself is this because we are really bad, or we are really weak, or we are a threat or the west just cant stand us? 689) Whoever God prefers, Mubarak prefers !! Last week President Mubarak has enjoyed visiting his favourite place outside Egypt "Italy" after he fully recovered from the surgery ( I really hope that this visit's agenda was mainly to take Italy into our side in the Nile Valley conflict specially that it has big influence in Ethiopia). What I have noticed in the press conference following his meeting with the Italian PM is that he was taken by a question of who will be his successor. He surprisingly answered: ‘Whoever God prefers, I prefer’... tayeb we malo, wa ne3ma Bellah!. However, at the end of the press conference (documented in Ahram coverage) he said that he and Berlusconi will be opening the Italian University in Egypt in 2017 (he will be about 90), and the Italian PM (who will be about 80) didn't oppose that. This means that God prefers meen ya Welad? da7na neb2a ba2ar ya ged3an law sebna el ragel dah yo7kom! 688) Are you Rich enough?! I have lately been exposed to extreme differences in salaries scales where I know people (Employees in Cairo) who earn 50K per month, and others of the same age and years of experience who don't exceed 4 or 5K. The weird thing that both of them don't consider themselves rich although of one of them is earning 10 times the other. How to know if you are rich or not? Is it by the amount of money your earn, or the amount of money you spend, or if you have supportive friends, and family, or is it a state of mind regardless of what you own? 687) Women ... Oh Women! Are you really from the same material man is made of? Are you all aslan from the same material? I don't think so. I think that Women are sooo sophisticated to the extent that every woman can be an independent species of her own (ma3 el e3tizar le 2abou el leef who sees that all women are the same). Women are not the same, they may share common laws, standards, interests, but each woman is a unique case, and that is the BEAUTY OF THEM. 686) Egyptian Humiliation; Feeling Like Home ! In Khartoum: We was beaten by the Algerians in the streets. In Darfour: Our peacekeepers were killed. In Sinai: Our Guards are shot on monthly basis now. In Saudi Arabia: Our citizens are humiliated. In Kuwait: We were kicked off the country. In UAE: We were laid off. In Algeria: We were poisoned, and our investments are threatened. In Lebanon: An Egyptian was ... I can even describe what happened. In Iraq: Our Ambassador was killed. In Quds: Our Foreign Minister was beaten by shoes. In Germany: We were killed (Marwa El Sherbini). In Italy & USA: We were busted and thrown into jails. In Nile Valley: We were rejected. In the Mid. and Red Seas: We simply drowned. In Egypt: We are beaten, rapped, humiliated, killed (on physical and psychological levels),...etc. The weird thing that I feel guilty not ashamed... May be because I dont know what to do to stop this snowball of humiliation. It is really hard when you love the country and hate it at the same time. 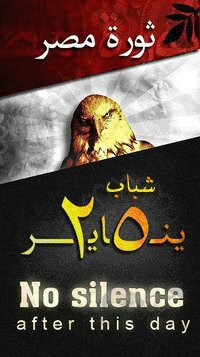 This country needs a complete revolution and a very soon one as well. 685) "Miss Egypt" kamam we kaman ! 100 posts ago (post 585), I have written about the controversial Miss Egypt. It has been getting hits and comments till today. So I though of following up with a Video of her latest "contributions & competitions". Here you are, belhana wel shefa! P.S. For those who are experts in such competitions, why is she walking like that?! 684) Ekhtarnah ... Ah Yana Ah !!! 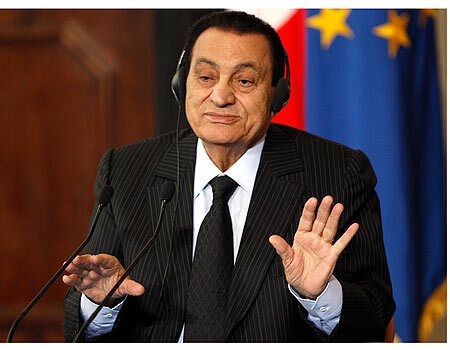 Since today is President's Mubarak's 82nd Birthday, I thought of sharing this with you.. Hilarious, I couldn't stop laughing WITH TEARS! إخترناه و بايعناه و إحنا معاه إن شاء الله ! مش متكبر ولا متجبر هادى و أبسط خلق الله!!!! This is about a woman in Saudi Arabia who got divorced because she insisted to trim her eyebrow! I just can't believe it!!!!! القاهرة - قرر زوجان في المدينة المنورة الانفصال عن بعضهما عقب 3 أعوام من الارتباط، إثر خلاف فقهي نشب بينهما، تمحور حول نتف الحواجب أو ما يعرف ب"النمص". وذكرت صحيفة "عكاظ" الأحد أن الزوجة تقدمت بطلب طلاق إلى المحكمة، عندما فشلت محاولاتها في إقناع زوجها برأي بعض العلماء، الذين أباحوا "نمص الحواجب"، فيما كان الزوج متمسكا برأي آخر معارض لها. من جهتها، حولت المحكمة العامة في المدينة المنورة القضية إلى مجلس صلح لتقريب وجهات نظر الزوجين، بيد أن كل طرف تمسك برأيه، ما أدى إلى إنهاء العلاقة الزوجية وحصول الزوجة على صك الطلاق.